Lindsay Cutting, Assistant Manager at our Bury St Edmunds travel agents and one of our Australia and New Zealand specialists, took a tour of Victoria. Along the way, she got the chance to sample some fantastic local wines and check out some of the adorable wildlife. We flew with Etihad on an A380 from London to Abu Dhabi. It was an excellent flight with good seat pitch, brilliant seat back entertainment on a huge screen and a very quiet flight. However, the food did let them down slightly. We changed to a 777 from Abu Dhabi to Melbourne and the flight was ok but we had been spoilt by the previous leg of the journey and unfortunately we were served the same food. The staff were rather stern-faced too on both flights and I felt that a little interaction with passengers would have offered a more friendly service. The Swanston Hotel Mercure is in a great location in the centre of Melbourne. It’s opposite a shopping mall and a just few yards from China Town. The rooms were large but we were disturbed by noise from a band from midnight to 4am, even though we were on the 11th floor. I would recommend requesting a high floor and quiet room. The buffet breakfast, however, was excellent. The Yarra Valley Lodge is located in the grounds of the Heritage Golf and Country Club only 45 minutes’ drive from the centre of Melbourne in the wine region of the Yarra Valley. It’s a beautiful hotel in a very quiet location with large, comfortable rooms that are tastefully decorated. The Ramada Resort Phillip Island is a large resort consisting of two and three bedroomed self-contained units on 65 acres of land. It is ideal for families looking to stay in the area before visiting the Penguin Parade or the beach. It has onsite tennis courts, swimming pools, cafe and a pizzeria but we did find it rather like a maze and difficult to find our apartment at night. The Flinders Hotel is a very modern property located right in the centre of the seaside village of Flinders. Breakfast is taken in the Georgie Bass Cafe over the road and dinner in the Deck Bar and Bistro opposite the hotel. All are within walking distance. All of the above hotel rooms came with tea and coffee making facilities, hairdryers, irons and ironing boards and some provided robes. The Grand Hyatt in Collins Street, Melbourne has wonderful views over the city and has undergone a massive refurbishment. It’s a 5-star hotel which lives up to expectations. The Chateau Yering in the Yarra Valley is a heritage listed property built in 1854 and set amongst beautiful historic gardens. All rooms are traditionally furnished with large bathrooms and four-poster beds. The Lindenderry at Red Hill resembles a French Chateau. It’s in an amazing location with enviable views over the winery and is popular with weddings. The Beacon Resort Queenscliff is a family resort surrounded by a national marine park. It’s ideal for families as it’s self-catering and only 90km south of Melbourne. We had a highlights tour of Melbourne and the area taking in St Kilda and several parks. We visited a range of different wineries and sampled delicious local wines from the Rochford Winery, De Bortoli Winery and Montalto Vineyard, to name just a few. Healesville Sanctuary is a local conservation centre where we saw many of the animals unique to Australia such as Koalas, Emus, Wombats and Tasmanian Devils. Unfortunately, as the weather was very wet, most of them preferred to stay in the warm. The Koala Conservation Centre, where we were able to pet a Koala, was amazing. The Phillip Island Penguin Parade is one of the biggest draws for people visiting this part of Australia. We were able to see these tiny creatures file past us from the viewing platform and they also have a dug-out area in which the penguins come up close to the glass. It was a magical and unforgettable experience. At Peninsula Hot Springs, we had the chance to relax and bathe in the therapeutic baths. Nobbies Centre is an interactive virtual journey into the world of the Southern Ocean and Antarctica. It’s great for educating children and offers interaction with virtual Antarctic wildlife. A Wild Ocean Eco Boat Adventure took us to see Australia’s largest fur seal colony. It was a great trip where the seals got up close to the boat. I loved the entire trip, as I have been to Melbourne several times but never ventured far from the city. We had an excellent tour guide in Steve from Bunyip Tours who drove us around the southern part of Victoria visiting all these fantastic wineries, sampling great wines and eating amazing food. Two highlights for me were the penguins and the Koalas. Hiring a car in this area is the best way to get around and, once outside Melbourne, the driving is made easy by the fact that they drive on the same side of the road as the UK. We were only on the road for a maximum of two and a half hours in one go. This trip is easily do-able in 5 days. Nothing; it was very well organised and everything went according to plan. 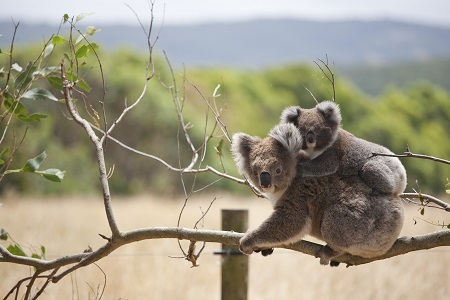 I would definitely recommend this holiday as it is the best way to see the wine regions of Victoria along with the Australian wildlife that lives there. It saves having long days on day trips and you get to see the local countryside. We had a great group and Denise from Travel 2 was a brilliant group leader. The trip was organised by Tourism Victoria and, although we were only in Australia for 6 days, we saw a lot in a short time. It is a great city to visit after having done Sydney, the Rock and Reef. If you would like to plan an Australian adventure like the one that Lindsay enjoyed so much, speak to one of our knowledgeable experts today. You can drop by one of our travel shops in East Anglia or along the south coast or call the number of your local branch.